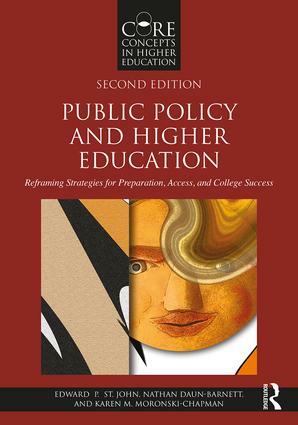 Public Policy and Higher Education provides readers with new ways to analyze complex state policies and offers the tools to examine how policies affect students’ access and success in college. Rather than arguing for a single approach, the authors examine how policymakers and higher education administrators can work to inform and influence change within systems of higher education using research-based evidence along with consideration of political and historical values and beliefs. Raising new questions and examining recent developments, this updated edition is an invaluable resource for graduate students, administrators, policymakers, and researchers who seek to learn more about the crucial contexts underlying policy decisions and college access. Case Studies—allow readers to examine strategies used by different types of colleges to improve access and retention. Reflective Exercises—encourage readers to discuss state and campus context for policy decisions and to think about the strategies used in a state or institution. Approachable Explanations—unpack complex public policies and financial strategies for readers who seek understanding of public policy in higher education. Research-Based Recommendations—explore how policymakers, higher education administrators, and faculty can work together to improve quality, diversity, and financial stewardship.